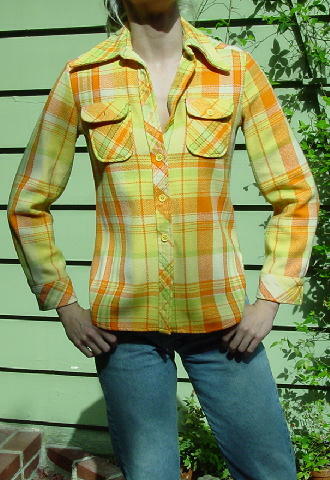 This vintage late '60s or early '70s plaid jacket is in medium and light yellow, lime and moss green, orange, and light cream. It has a big pointy collar, 2 breast pockets with flaps that button, and long sleeve 2-button cuffs. There are 7 buttons going down the front. All of the buttons are a bright medium yellow. 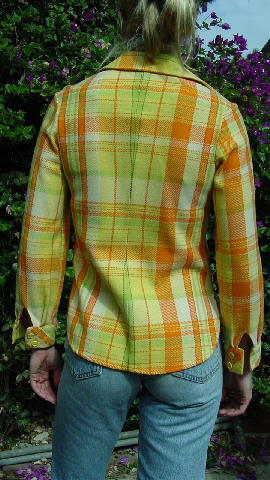 The rounded shirt tails with 5" side slits give the jacket a western look.